Here's a gorgeous picture book. Your Mother Didn't Do That was written by Sharon Holt, illustrated by Brian Lovelock, and published by Walker Books Australia (2009). As in most excellent picture books, Holt's story is deceptively simple. When Holly doesn't want Mum to go out, Dad promises to tell her a story about the night she was born. Holly and Dad embark on a shared narrative, discussing all the ways Holly WASN'T born. She didn't hatch, wasn't kept in dad's belly like a baby seahorse, or protected in a pouch like a joey kangaroo after birth. When Dad finally reveals that when Holly was born, "your mother held you close to her heart and cried and cried", Holly worries that Mum was very sad but learns that they were happy tears. Dad and Holly decide they must have been the happiest parents and baby in the world. I love the way Holt has captured the dialogue between the pair, making us feel as if we are privileged to be part of a loving family story time. Lovelock's illustrations add another dimension to the book, as well as complementing the people Holt reveals. He's given the pictures a textured flow by using what looks to be a dry brush though paint over marbled paper. This really adds movement to the pages. And his people are lovely. We can tell by Dad's words he is a loving father, but his eyes especially bring him to life. Lovelock also illustrated Roadworks, which I reviewed here at The Book Chook. This is a beautiful book, with a lovely message for kids about loving families, and that people can cry with happiness. It would make a great choice for a baby shower gift or be a good focus for discussion about parents and babies. 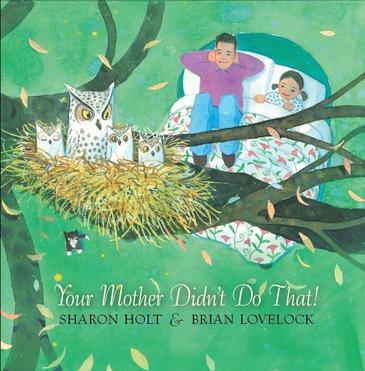 One follow-up activity to reading Your Mother Didn't Do That would be to have your kids explore the techniques Lovelock uses in the illustrations. If you need a start, Walker has a colouring page available at their website. You could also ask them to think about other ways human mums are different to animal mums (for a start, are animal mothers as keen on kids tidying their rooms? ), or create their own books about animal mothers and their babies. I like the book just for its title! It's another lovely book to add to your list, Kelly! What a sweet story, I am going to have to hunt this book down. I hope my local library carries it, it sounds like a winner.